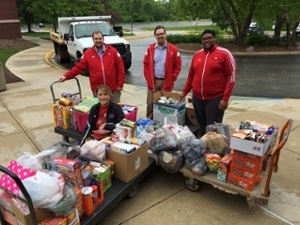 Southern Illinois University Edwardsville’s University Housing residents who moved out in spring 2016 had the opportunity to donate excess food and goods before leaving campus, making for a lighter car ride home and a more sustainable May closing. Like previous years, University Housing partnered with USAgain to collect textiles, including clothing and shoes, and the National Residence Hall Honorary (NRHH) Red Storm Chapter hosted a food drive in each of the housing communities. USAgain provides consumers with a convenient and eco-friendly option to rid themselves of excess clothing, which is diverted from wasting in landfills for resale in the U.S. and abroad. This spring, University Housing residents donated 3,429 pounds of textiles to the USAgain program. This is an increase of 1,119 pounds from spring 2015 and equal to 8,229,600 gallons of water and 19 cubic yards of landfill space saved. In addition, the donation equals the prevention of 51,435 pounds of CO2 emissions. In recognition of these efforts, USAgain recently presented University Housing with its Certificate of Sustainability. The NRHH Red Storm Chapter hosted a food drive from April 27–May 8 in each of the housing communities. Food collected from the food drive was donated to the Glen Ed Food Pantry and will benefit people in Edwardsville, Glen Carbon and surrounding areas. University Housing residents donated 1,560 pounds of food. For more information on sustainability initiatives in University Housing, please contact Rex Jackson at rjackso@siue.edu or 618-650-4628. Photo: (L-R) Josh Moermond, Cougar Village community director, McKenzie Whitaker, Prairie Hall community director and NRHH advisor, Scott Baietti, Bluff Hall community director and Marcus Powell, University Housing resident assistant and NRHH member, helped collect more than 1,500 pounds of food.